Israeli Prime Minister Benjamin Netanyahu recently discontinued the Temporary International Presence in Hebron, or TIPH, which had monitored human rights in the city for more than two decades. “We will not allow the continuation of an international force that acts against us,” Netanyahu said. In response, Palestinian activists launched a grassroots campaign to document rights violations and protect residents from Israeli settler attacks in TIPH’s place. How did TIPH come about, what did it accomplish, and why did Netanyahu target it now? This policy memo by Al-Shabaka analyst Belal Shobaki sheds light on Netanyahu’s move and suggests ways for the international community to better defend Palestinian rights. On February 25, 1994, Israeli settler Baruch Goldstein shot dead 29 Palestinians while they prayed in the Ibrahimi Mosque in Hebron. The UN Security Council condemned the crime and called for the protection of Hebron’s residents. Italy and Norway sent an observer mission soon after, but it only operated for three months. Three years later, Article 18 of the 1997 Hebron Protocol stipulated the creation of an international presence with duties identified by the PLO and Israel. The Temporary International Presence in Hebron was thus created, with participation from Denmark, Italy, Norway, Sweden, Switzerland, and Turkey. TIPH monitored and reported on the human rights situation primarily in Hebron’s old city and the Tel Rumeida neighborhood, its members’ white cars with a red logo a familiar sight. In addition, the mission developed relations with the Palestinian community and helped improve its living conditions, such as by supporting projects in the areas of women’s economic empowerment, education, and psychosocial support and rehabilitation. Mission members moved freely and lived in Palestinian areas. Though TIPH’s role was limited, and as such it was unable to effectively prevent Israeli attacks, Palestinians welcomed its presence. Israeli settlers in Hebron, in contrast, believed that TIPH restricted their plans for expansion in the old city, which they abetted by violently attacking Palestinian residents, inducing a significant number to move from the old city to other areas of the metropolis. Settlers also attacked mission members. It has been more than 20 years since TIPH began publishing reports to document Israeli human rights violations, upsetting the Israeli government, right-wing parties, and settlers. Moreover, Netanyahu himself was the prime minister who signed the Hebron Protocol in 1997. So why did Netanyahu make this move now? First, the Likud Party has become more submissive to far right-wing parties, which for years have been waging a fierce campaign to incite settlers to attack TIPH. Netanyahu is thus likely appealing to far-right Israeli voters in the lead-up to the Knesset elections in April 2019. The moment also took advantage of Palestinians’ preoccupation with domestic issues such as social security, government formation, the Palestinian Legislative Council’s dissolution, and national reconciliation. Second, the move must be understood in the context of Israel’s mass expansion of settlements in the West Bank and Jerusalem, with Hebron holding special importance for extreme Zionists. By making the displacement of Palestinian residents from the old city less visible to the international community, Israel’s expansion will be rendered that much easier. Third, the choice for Israel was not particularly difficult: either allow TIPH to continue, along with its semi-daily reports of condemnation, or eject it and withstand temporary international rebuke – rebuke that Israel can withstand for the sake of facilitating its expansionist drive in the West Bank. The settlers will consider the discontinuation of TIPH a green light to practice violence, thus jeopardizing the lives and basic rights of Palestinians. The move could also result in Israel’s complete withdrawal from the Hebron Protocol. Israel is clearly pursuing a policy that contravenes all agreements signed with the Palestinians, and violates the principles of humanitarian protection granted to civilian populations under occupation as per international conventions. Netanyahu’s discontinuation of TIPH is one manifestation of this policy. Israeli violations will persist unless Palestinians receive genuine international assistance and protection. 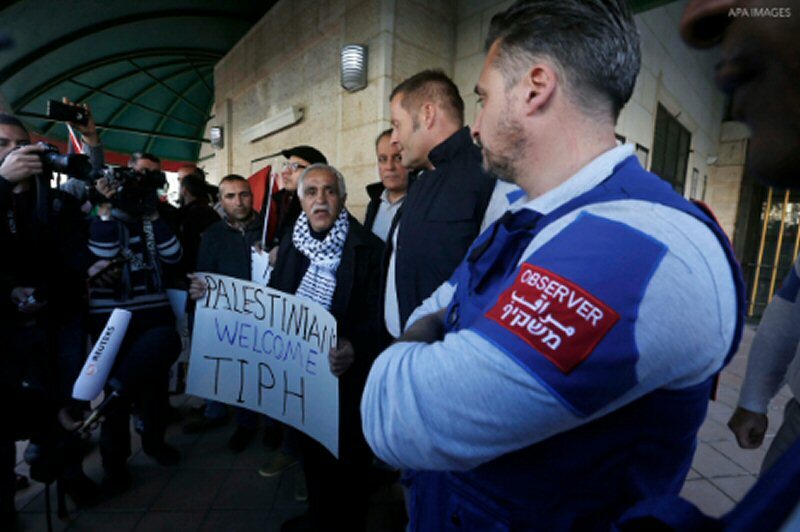 EU countries should exercise serious pressure on Netanyahu’s government to retract the move against TIPH. Israel’s diplomatic, political, economic, and cultural ties with EU countries should be utilized to pressure Israel to cease its violations of Palestinian human rights in Hebron and the rest of the Occupied Palestinian Territory. The countries participating in TIPH must view Netanyahu’s act as a direct contestation of the mission’s peacekeeping purpose, and take the appropriate diplomatic measures to respond to this offense. EU countries should support Palestinian efforts to pursue accountability for Israeli human rights violations at the international level, given that the mission’s presence was in line with UN Security Council Resolution 904.